To Cite: Mirzaii-Dizgah I, Khademi A. Serum and Stimulated Saliva C-reactive Protein Changes in Altitude Chamber, Ann Mil Health Sci Res. 2017 ; 15(3):e66590. doi: 10.5812/amh.66590. Objectives: The object of the research was to examine stimulated saliva and serum C-reactive protein (hs-CRP) prior and following the experience of hypobaric hypoxia process (EHHP) in an altitude chamber in aviators. Methods: A total of 40 healthy aircrew (age: 31.8 ± 6.0 years; BMI: 25.6 ± 2.7 Kg/cm2) experienced hypobaric chamber. Hs-CRP levels were assayed in stimulated whole saliva and serum before and after intervention by the ELISA method and were statistically analyzed by the paired student’s t test. Results: Mean serum hs-CRP concentration was significantly increased following intervention (before: 1.78 ± 0.33 µg/mL versus after: 2.58 ± 0.45 µg/mL) (p = 0.02). Stimulated saliva hs-CRP level was also significantly higher following EHHP (1.71 ± 0.17 ng/mL) compared to before experiencing it (0.79 ± 0.12 ng/mL, P = 0.007). Conclusions: It seems that the salivary and serum levels of hs-CRP rise following the experience of hypobaric hypoxia process. Hypoxia is one of the most serious threats to modern aviation. Regardless of efforts to avoid and reduce its side effects, it still causes many problems for pilots (1). During ascendance, barometric pressure drops and ambient air breathe decreases partial pressure and oxygen content of the lung. Even 25% drop in the oxygen pressure in the air over 8000 feet altitude causes a visible disruption in mental performances. However, a rapid climb to over 50 000 feet causes lung's rapid decompression that reduces oxygen pressure of the lungs to 10% above the sea level (about 87 mmHg). This will cause loss of consciousness after 12 to 15 seconds and death after 4 to 6 minutes. For this reason, most military aviators are being trained to experience hypoxia in hypobaric chambers under controlled conditions. Non-military aviation is also threatened with this problem (2). Hypobaric hypoxia training is done by a hypobaric chamber and it is repeated every 3 years for recalling the symptoms and training. Altitude chamber is one of the physiologic trainings in aerospace medicine. This chamber simulates low pressure environment and it also simulates flight to a predetermined altitude (mostly at 25,000 feet) based on flight protocol. The aim of this training is to allow aviators to experience hypoxia symptoms so they can deal with these symptoms in the real flight. This training has a significant effect on prevention of air accidents because 75% of air accidents are human-dependent (3). Hypobaric hypoxia also increases heart rate and cardiac output (4). However, the most important effect of hypoxia is cerebral impairment due to a decrease in neurons sensitivity. These effects include judgment, memory, motor, and ability to work impairments (5). Hs-CRP is a proinflammatory atherogenic marker of circulating and one of the independent predictors of cardiac disease (6). It is produced in liver and excreted in inflammatory situation (7); hs-CRP could be a valid and independent predictor of cardiac attack, cardiac arrest due to vascular obstruction, and vascular diseases (8). Several studies indicated the effects of hypoxia on humans. One of them was done by Magalhes et al. in 2004 about the effects of altitude on glutathione reduction (9). In 2010, Vigo et al. showed that hypobaric hypoxia causes some autonomic variability, such as liner heart rate variability (HRV). They placed 12 military pilots in low-pressure altitude with supplementary oxygen. HRV was assessed at 8,230 meters altitude before and after hypoxia. The results of this study revealed that hypoxia reduces linear HRV, but it increases non-linear HRV. This pattern is similar to heavy exercise or high risk ischemic heart diseases (10). It has been shown that serum iron profile significantly increases with biphasic pattern in altitudes exposure in the hypobaric chamber (at 8,000 feet) for 8.5 hours (11). Military aircrew must be trained for acute hypoxia in altitude chambers. However, this training may cause some side effects. In addition, it has been shown that CRP raises in some injuries, but the effects of experience of hypobaric hypoxia process (EHHP) in altitude chamber on this marker has not yet been assessed. The present study aimed at investigating the serum and stimulated salivary level of hs-CRP alterations following acute EHHP in altitude chamber. A total of 40 healthy military aircrew (age: 31.8 ± 6.0 years; BMI: 25.6 ± 2.7 Kg/cm2), who were referred to the hypobaric chamber for periodic hypobaric hypoxia sign experience, were selected to participate in this cross- sectional study. Volunteers performed 30 minutes of preoxygenation with 100% O2, to minimize the occurrence of decompression sickness. A typical hypoxia experience profile is as follows: (1) ascending to 30,000 ft altitude at 4 000ft per minute breathing pure O2 from a regulator; (2) removing air mask and breathe hypobaric air for hypoxia experience under direction and supervision of the medical officer subjectively; (3) putting on the mask again immediately after appearance of hypoxic signs and symptoms; and (4) descending to ground level at 4000 ft per minute. The termination of hypoxic experience was subjective and according to participants enunciate of hypoxic symptoms. Saliva and venous blood were collected at the same time from each aviator before and following the EHHP in altitude chamber between 9.00 A.M. and 12.00 P.M. Participants began to collect the stimulated whole saliva into a tube while continuing chewing the gum. Two mL of venous blood was drained closely after saliva sampling. Then, the specimens were centrifuged at 3800 g for 10 minutes and stored at -80°. Hs-CRP was measured by ELISA kits (BioVendor) according to the manufacturers’ instruction. The results are offered as mean ± s.e.m and analyzed by paired two-tailed student’s t test using SPSS software Version 16. A total of 40 aviators aged 22 to 45 years, who had to experience altitude chamber in their flight trainings, participated in this study. Their average age was 31.8 ± 6.0 years, and their average BMI (body mass index) was 19 to 31 Kg/cm2 (mean 25.6 ± 2.7). Mean serum hs-CRP concentration was significantly increased following EHHP (before: 1.78 ± 0.33 µg/mL vs. after: 2.58 ± 0.45 µg/mL) (P = 0.02; Figure 1A). Data are expressed as Mean ± SEM; *P < 0.05. For hypobaric hypoxia sign, the pilot must be sited inside the virtual chamber once every 3 years. In this process, the pilot must inhale pure oxygen with atmospheric pressure prior EHHP, go up to 30,000 ft altitude, inhale hypobaric air until hypoxic signs appear, and come down to ground level. We evaluated hs-CRP alteration in saliva and serum following EHHP and found that it significantly increased both in serum and saliva. After EHHP in the altitude chamber, the pilots emphasized that they were very tired and worn, as if they have done a heavy work. It seems that all the body cells are affected by this process. It seems that EHHP affects all body's cells and damages cells, especially in the active organs such as the heart, and causes general inflammation. CRP increases in inflammation and is a non-specific indicator for disease. Acute hypobaric hypoxia in altitude chamber causes tachycardia and increases cardiac output in aviators (4). This can cause a significant increase in serum cardiac markers. Moreover, competitive endurance sports and also prolonged walking are associated with higher cardiac markers (12, 13) and increased myocardial requirement, as endurance exercises may increase the physiological turnover of cardiac markers (14). This mechanism is acceptable because there was myocardial requirement increase in aviators in this study. Altitude chamber experience is similar to a heavy exercise; hs-CRP could be a valid and independent predictor of cardiac attack, cardiac arrest due to vascular obstruction, and vascular diseases. Of course, serum and saliva hs-CRP does not rise in non-necrotic myocardial ischemia, so it may not determine the myocardial ischemia (8). However, the significant increase in serum and saliva hs-CRP after altitude chamber training in this study could be due to general inflammation because of generalized hypoxia. The elevation of serum hs-CRP is considerably more in acute MI. However, in this study, aviators removed their mask for 3 to 5 minutes at 25,000 feet altitude based on flight protocol, so they would be generally exposed to hypobaric hypoxia. Also, it effects their heart (only on laboratory findings and not clinically) and creates minor cellular damages. However, hs-CRP is not normally detectable in serum, but hypoxia causes this elevation. This significant increase in serum hs-CRP is not as sensitive and specific as myocardial injury in acute MI, but this slight elevation could be due to the effects of acute EHHP on the cardiac myocytes and other tissues as an inflammatory factor. Thus, this study revealed a significant increase of serum hs-CRP after hypoxia in altitude chamber process. Undoubtedly, 3 to 4 minutes exposure to hypoxia or a 30- minute pure O2 breathing cannot cause cell damage. It seems that each of pure O2 breathing, ascending to altitude, breathing hypobaric air, and descending in this process cannot cause hs-CRP alteration, but it seems that combination of these factors cause cell damage and problems for pilots. The reasoning of our study for assessing hs-CRP in salivary secretions is that saliva will be noticed as a diagnostic fluid in the future. It is believed that saliva is a body mirror and may be approved as a promising tool for monitoring the health status and illness of a person in health care programs. Several evidence has been proven and suggested using saliva tests to diagnose, monitor, and predict disease prognosis. It has been indicated that numerous biochemical molecules can be assayed in saliva of patients, for example, cortisol (15), progesterone (16), 17β-estradiol (17), CA15-3 (18), CA125 (19), creatine kinase MB (8), creatine phosphokinase (20), parathyroid hormone (21), cathepsin (22), hc-CRP (23), and aminotransaminase (24). Much attention has been paid to saliva as a biological sample because of the rapid, uncomplicated and non-invasive nature of the sample. In addition, oral fluid sampling is safe for both operators and patient and its storage is easy and cost-effective (25). It seems that the salivary and serum levels of hs-CRP rise following the experience of hypobaric hypoxia process. Conflict of Interests: Authors declared no conflict of interests. 1. Cable GG. In-flight hypoxia incidents in military aircraft: causes and implications for training. Aviat Space Environ Med. 2003;74(2):169-72. [PubMed: 12602449]. 2. Ernsting J, Nicholson AN, Rainford D. Aviation medicine. CRC Press; 1999. 3. DeHart RL, Davis JR. Fundamentals of aerospace medicine. Lippincott Williams & Wilkins; 2002. 4. Zupet P, Princi T, Finderle Z. Effect of hypobaric hypoxia on heart rate variability during exercise: a pilot field study. Eur J Appl Physiol. 2009;107(3):345-50. doi: 10.1007/s00421-009-1123-5. [PubMed: 19629516]. 5. Berne RM, Levy MN. Principles of physiology. Mosby Incorporated; 2000. 6. Asegaonkar SB, Marathe A, Tekade ML, Cherekar L, Bavikar J, Bardapurkar J, et al. High-sensitivity C-reactive protein: a novel cardiovascular risk predictor in type 2 diabetics with normal lipid profile. J Diabetes Complications. 2011;25(6):368-70. doi: 10.1016/j.jdiacomp.2011.10.001. [PubMed: 22055258]. 7. Jaffe AS, Babuin L, Apple FS. Biomarkers in acute cardiac disease: the present and the future. J Am Coll Cardiol. 2006;48(1):1-11. doi: 10.1016/j.jacc.2006.02.056. [PubMed: 16814641]. 8. Mirzaii-Dizgah I, Hejazi SF, Riahi E, Salehi MM. Saliva-based creatine kinase MB measurement as a potential point-of-care testing for detection of myocardial infarction. Clin Oral Investig. 2012;16(3):775-9. doi: 10.1007/s00784-011-0578-z. [PubMed: 21681388]. 9. Magalhaes J, Ascensao A, Viscor G, Soares J, Oliveira J, Marques F, et al. Oxidative stress in humans during and after 4 hours of hypoxia at a simulated altitude of 5500 m. Aviat Space Environ Med. 2004;75(1):16-22. [PubMed: 14736128]. 10. Vigo DE, Perez Lloret S, Videla AJ, Perez Chada D, Hunicken HM, Mercuri J, et al. Heart rate nonlinear dynamics during sudden hypoxia at 8230 m simulated altitude. Wilderness Environ Med. 2010;21(1):4-10. doi: 10.1016/j.wem.2009.12.022. [PubMed: 20591347]. 11. Coste O, Chaumet G, Van Beers P, Touitou Y. Hypobaric impact on clinical tolerance and 24-h patterns in iron metabolism markers and plasma proteins in men. Chronobiol Int. 2011;28(5):434-45. doi: 10.3109/07420528.2011.579214. [PubMed: 21721859]. 12. Eijsvogels T, George K, Shave R, Gaze D, Levine BD, Hopman MT, et al. Effect of prolonged walking on cardiac troponin levels. Am J Cardiol. 2010;105(2):267-72. doi: 10.1016/j.amjcard.2009.08.679. [PubMed: 20102930]. 13. Tanindi A, Cemri M. Troponin elevation in conditions other than acute coronary syndromes. Vasc Health Risk Manag. 2011;7:597-603. doi: 10.2147/VHRM.S24509. [PubMed: 22102783]. 14. Middleton N, George K, Whyte G, Gaze D, Collinson P, Shave R. Cardiac troponin T release is stimulated by endurance exercise in healthy humans. J Am Coll Cardiol. 2008;52(22):1813-4. doi: 10.1016/j.jacc.2008.03.069. [PubMed: 19022162]. 15. Agha-Hosseini F, Mirzaii-Dizgah I, Mirjalili N. Relationship of unstimulated saliva cortisol level with severity of oral dryness feeling in menopausal women. Aust Dent J. 2011;56(2):171-4. doi: 10.1111/j.1834-7819.2011.01320.x. [PubMed: 21623809]. 16. Mirzaii-Dizgah I, Agha-Hosseini F. Stimulated and unstimulated saliva progesterone in menopausal women with oral dryness feeling. Clin Oral Investig. 2011;15(6):859-62. doi: 10.1007/s00784-010-0449-z. [PubMed: 20652338]. 17. Agha-Hosseini F, Mirzaii-Dizgah I, Mansourian A, Khayamzadeh M. Relationship of stimulated saliva 17beta-estradiol and oral dryness feeling in menopause. Maturitas. 2009;62(2):197-9. doi: 10.1016/j.maturitas.2008.10.016. [PubMed: 19144478]. 18. Agha-Hosseini F, Mirzaii-Dizgah I, Rahimi A. Correlation of serum and salivary CA15-3 levels in patients with breast cancer. Med Oral Patol Oral Cir Bucal. 2009;14(10):e521-4. [PubMed: 19680209]. 19. Agha-Hosseini F, Mirzaii-Dizgah I, Rahimi A, Seilanian-Toosi M. Correlation of serum and salivary CA125 levels in patients with breast cancer. J Contemp Dent Pract. 2009;10(6):E001-8. [PubMed: 20020075]. 20. Mirzaii-Dizgah I, Jafari-Sabet M. Unstimulated whole saliva creatine phosphokinase in acute myocardial infarction. Oral Dis. 2011;17(6):597-600. doi: 10.1111/j.1601-0825.2011.01817.x. [PubMed: 21635668]. 21. Agha-Hosseini F, Mirzaii-Dizgah I, Mansourian A, Zabihi-Akhtechi G. Serum and stimulated whole saliva parathyroid hormone in menopausal women with oral dry feeling. Oral Surg Oral Med Oral Pathol Oral Radiol Endod. 2009;107(6):806-10. doi: 10.1016/j.tripleo.2009.01.024. [PubMed: 19386515]. 22. Mirzaii-Dizgah I, Riahi E. Serum and saliva levels of cathepsin L in patients with acute coronary syndrome. J Contemp Dent Pract. 2011;12(2):114-9. [PubMed: 22186754]. 23. Mirzaii-Dizgah I. Serum and Saliva Levels of High-Sensitivity C-reactive Protein in Acute Myocardial Infarction. J Mol Biomark Diagnos. 2012;3(4). doi: 10.4172/2155-9929.1000128. 24. Mominzadeh M, Mirzaii-Dizgah I, Mirzaii-Dizgah MR, Mirzaii-Dizgah MH. 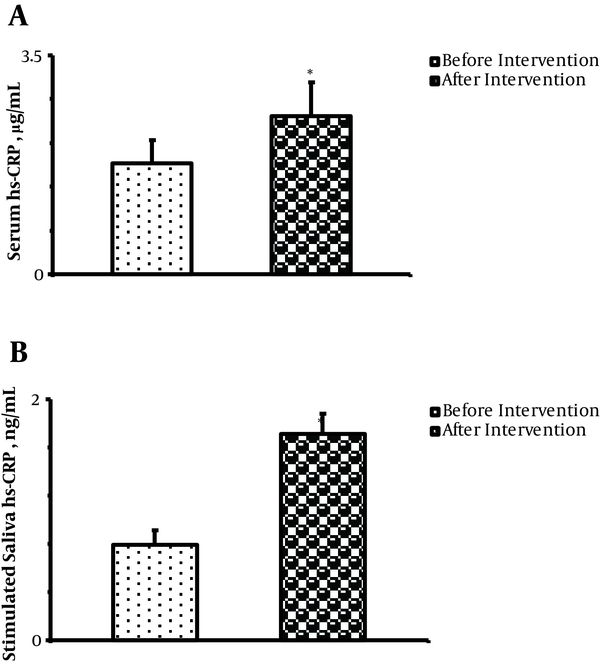 Stimulated saliva aminotransaminase alteration after experiencing acute hypoxia training. Air Med J. 2014;33(4):157-60. doi: 10.1016/j.amj.2014.03.004. [PubMed: 25049186]. 25. Mirzaii-Dizgah I, Mirzaii-Dizgah MR, Mirzaii-Dizgah MH. Stimulated Saliva Glucose as a Diagnostic Specimen for Detection of Diabetes Mellitus. J Arch Mil Med. 2013;1(1):24-7. doi: 10.5812/jamm.14609.